I love, love, LOVE Liz Lemon. And sandwiches. One of the first blogs I ever started following was Panini Happy – probably around 2007 or 2008. I love Kathy’s writing and she has some fantastic ideas for not only grilled cheese, but uses for your panini press. We registered for and received one as a wedding shower gift and it has given us nothing but amazing results over the past several years. While doing my nightly perusing of my favorite blogs, I came across her recipe for an asparagus and prosciutto panini sandwich. I had just picked up some asparagus at a local farmer’s market and was looking for a fun idea for how to use it. This panini caught my eye – using flavors and ingredients that I absolutely adore. And, of course, it’s a sandwich! 8 oz fresh mozzerella cheese, sliced into about 1/4″ (make sure you have enough for all the bread! 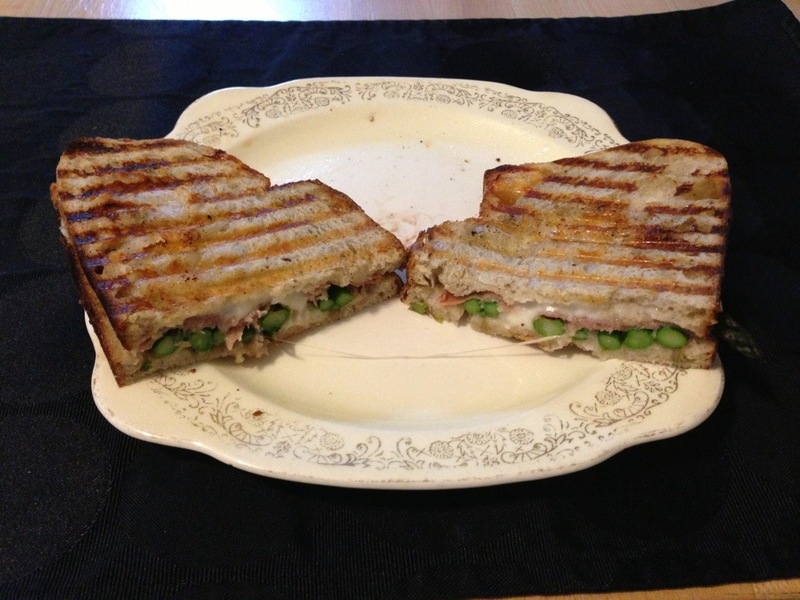 Turn on your panini press (mine doesn’t have a heat control – if it does, Kathy recommends a medium high heat). Lay the asparagus spears in a single layer onto the press, and grill for about 3 minutes until they turn a bright green. Remove from heat & wipe down the grates. To assemble the sandwiches: On one slice of bread, lay a slice of prosciutto, followed by about two slices of cheese. Then, add as many asparagus spears as will fit onto the bread without falling off. Top the sandwich with another slice of bread. Grill each sandwich for about 5 minutes until the cheese is melted and the bread is nice and crunchy. …either way, this sandwich is fantastic, easy to make, and is on the lighter side. I ate one before heading out to rec soccer – and once I started unwindulaxing (awesome word, thank you Lemon!) it was time for another one since I was pretty hungry. It definitely hit the spot! So while asparagus is still in season – and time is running out – go make this sandwich.